How far can you measure with a laser distance meter? Presentation of the Leica BLK3D: Measuring in photos! In November 2018 I had the opportunity to have a closer look on the BLK3D and to do first tests at LEICA’s “Geomatik News” in Zurich/Switzerland. So far there is no device with comparable functions available. So it’s no surprise that Leica has included this gadget in the BLK series. BLK stands for “Black” – black, as well as innovative and with an innovative design. The BLK3D is a so-called 3D imager which is hardly bigger than a smartphone. It contains two cameras on the backside facing away from the large display. There the cameras are arranged in diagonally opposite corners, so that the distance between the two lenses is as large as possible. They thus form a stereo camera which has been calibrated with such high accuracy that the images can be evaluated using photogrammetric methods. With the BLK3D you can make three-dimensional measurements directly in the photo. With the special evaluation software and the powerful processor, the images are analyzed photogrammetrically. The computing power corresponds to that of current premium smartphones. The aluminum chassis therefore not only serves the stability of the 3D imager: it offers a high-quality impression of the material and a pleasant feel. The chassis also serves to dissipate the heat from the processor. When many photos are taken and processed in short succession, a lot of computing power is needed and the aluminum case helps to prevent the BLK3D’s interior from overheating. 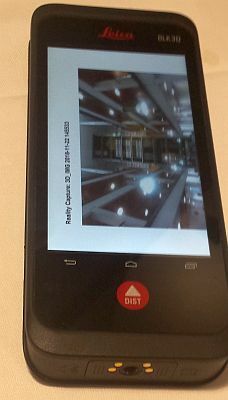 The device was developed by Leica Geosystems together with the parent company Hexagon and runs with Android as operating system. Therefore, you can also use your own or third-party software. 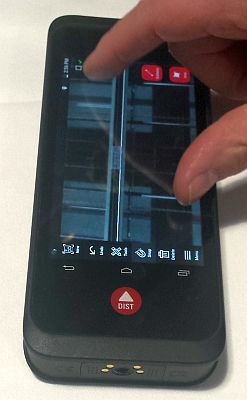 The operation works by gestures like wiping and zooming, just like you are used to from a smartphone. Taking photos and measuring distances is easy. There is the single-shot, where you press the shutter once, so that the stereo camera takes two photos. If the BLK3D then encounters difficulties in evaluating the two photos, the camera recommends a multiple shot by taking a step to the side. The software then searches for parallel lines in the photos, displays them and measures the distance between these lines. If a structure containing parallel lines is photographed and there is enough contrast in the image, these lines are automatically recognized by the software, traced and already completed with measurement lines. In my preliminary test of the BLK3D, it clearly convinced me with this automatic function. But I am also supported with manual measurements, i.e. I specify the line to be measured on the display. As soon as I release the measuring point near an edge in the image, the point automatically jumps to this edge. This function makes measuring faster and more accurate. 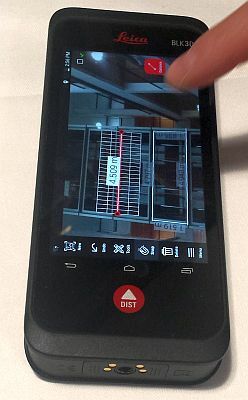 The photos and measurement data can be transferred to other devices via a built-in WLAN hotspot. Measurement reports can also be created in PDF format, which you can email to the office immediately if you’re in a hurry. The images can be transferred to a PC and then evaluated with special software. Because the photos are stored unchanged, you can repeat measurements in the image on the PC or make new ones, which may be easier with the larger screen. But normally you can’t work with the simple gestures on the PC, but have to zoom with the mouse for example. The BLK3D is ingenious when it comes to taking photos for quotations. This way you can document the situation and at the same time control the distances in the picture. You can also use the stereo camera to record progress on construction sites. What is important to add: The BLK3D is also a laser distance measurer. The laser diode and the sensors are arranged on the smallest side of the housing, as is the case with other rangefinders. The maximum distance meets the requirements of the BLK3D because it is 250 meters. The tripod thread and the electrical contacts around this thread stand out on the housing. We already know it from the Disto X3 and X4, which means that the BLK3D is also compatible with the DST360 and e.g. point-to-point measurements are possible. The team of Leica Geosystems is busy testing the achievable accuracy under various conditions. We will do a detailed review of the Leica BLK3D as soon as possible and report here about this exciting development. The BLK3D is expected to be available for customers in January 2019. So far we do not know if there will be geographic differences in the release date.